Rubber Chicken Congratulations Cards are the PÃ?Â¢??RFÃ?Â¢? ?CKT way to say "Here's an expression of praise for someone else's achievement!" and/or "good wishes onto you, good person, for today's your special occasion!" It doesn't get any more heart-felt than that...does it?! Hey, that was NOT a rhetorical question, ANSWER US! So we need you to know something about us...ah, this is awkward... ah, we're compulsive Rubber Chicken Congratulations Cards Creators! ...PHEW! Wow, that's a huge weight off our shoulders. You're a good listener, you know that?! Congratulations! The point is, we really like to create Rubber Chicken Congratulations Cards. Which doesn't sound like a problem... Until you realize WE CAN'T STOP! Help us! But Wait! There's Always More! We like creating Rubber Chicken Congratulations Card so much that now we have waaaaay too many of these freakin' RCC Congratulations Cards! No, seriously, even the producers of "Hoarders" told us we have a problem! So you know THEY'RE just like "real" doctors! They have their own cable series, so that's good enough for us! We also believe that Dr. Pepper is a REAL doctor, so long as he's willing to write us a prescription for Xanax (thank you, and "congratulations" to the 2-per-cent of you who got that)! This is Why OSHA Was Created in the First Place! Okay, if you're still reading this instead of sending out massive numbers of our Compliment Cards, then it's OBVIOUS that you don't yet understand the urgency and danger here. So let's make it very clear: We continue to create TOO MANY Rubber Chicken Congratulations Cards! So PLEASE start sending at least one Rubber Chicken Congratulations Card out to your friends Ã?Â¢? ?and those you care deeply aboutÃ?Â¢?? DAILY for the next several years! Yes, it's THAT urgent! And it doesn't cost you any more because you're already a subscriber (aren't you?!?). Good heavens! The collective weight of all these "un-sent-out" Rubber Chicken Congratulations Cards has just collapsed in on itself! Nothing can escape it's immense gravitational pull, NOT EVEN LIGHT!!!! Quick! 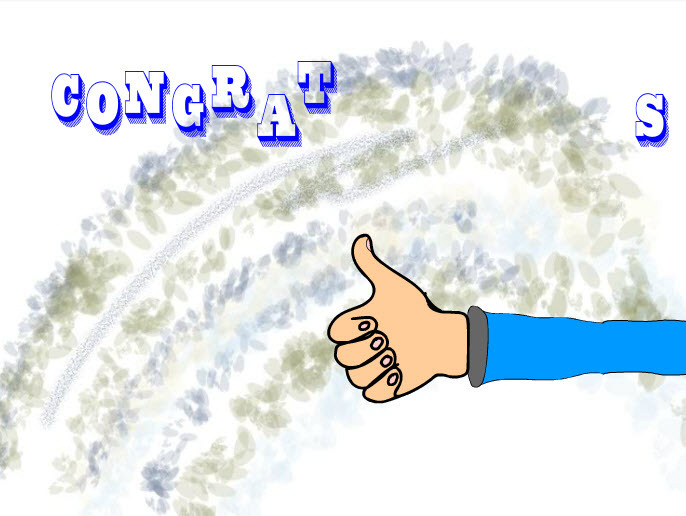 Send out more RCC Congratulations cards now, before it's too late!!! We've got one (or more) for EVERY occasion! Even stuff you'd never believe were real occasions! We even have one called, "Congratulations on observing the formation of a new Black Hole in your workplace!" Weird coincidence, huh?! But all COMPLETELY TRUE! Trust us, we're online animators! We're as honest as cable tv "doctors"! [crackle] We don't know how much longer... [pop sputter crackle] we can hold on! [schreesh crackle, crackle] our comm... un... ication [crackle snap pop] breakingÃ?Â¢?? IIIEEEEEEEeeeee! Honestly, there's so frickin' many of these Rubber Chicken Congratulations Cards piling up all around us that they now pose a danger to everyone working here! There's such an urgent need for you to IMMEDIATELY send out a dozen or more Rubber Chicken Congratulations Cards because the Sun's been blotted out by these towering stacks of Rubber Chicken Congratulations Cards! We've become so deprived of essential Vitamin D (because the mountains of our Congratulations cards have blotted out the Sun), that we're now too weak to pull ourselves to safety! You have no idea how terrifying this situaion has become for us. And we somehow feel partially responsible for this crisis! But NOW'S not the time to point fingers, unless you're using that finger to click on the "send" button! PLEASE we're begging you: SEND THESE CARDS NOW! Did you ever see that Star Trek episode called, "The Trouble With Tribbles" (the ORIGINAL 1960s Star Trek, not all those weird spinoffs)?! We're producing Rubber Chicken Congratulations Cards faster than Tribbles can gobble down Quadrotriticale high-yield grain! THAT'S A LOT OF FRICKIN' RCC CONGRATULATIONS CARDS!!! 'Cuz Tribbles never stop eating grain (just ask Arne Darvin, he's the assistant to Mister Baris, and Baris is the Federation Undersecretary in Charge of Agricultural Affairs in this quadrant)! The point is: these Congratulations cards are EVERYWHERE! They're in our water supplies! They're...[cough] clogging... [cough] all our air ducts! Please, you have to send these cards to your friends and family NOW! Even if the people you send them to didn't do anything to deserve congratulations, now's not the time to quibble, just get these cards OUT OF HERE! You're the only one who can save us! Hurry [cough cough]!